NSCAD University, also called the Nova Scotia College of Art and Design, is a post-secondary art school in Halifax, Nova Scotia, Canada. It was founded in 1887 by Anna Leonowens and later became the first degree-granting art school in Canada. 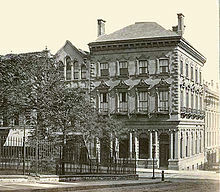 The school first opened in the Union Bank Building. School buildings along Granville Street. The university owns the entire city block. The university opened in the Union Building in 1887.:2,12 It was founded by Anna Leonowens (of Anna and the King of Siam fame). :3[a] It was originally called the Victoria School of Art and Design to commemorate Queen Victoria's Golden Jubilee. It moved to the Halifax Academy in 1890. One of the notable artists to be associated with the school in its early years was Arthur Lismer, who was a member of the Group of Seven and spent several years as the school president. :69–78 Elizabeth Styring Nutt succeeded Lismar as president in 1919. In 1957 the school moved into the former St. Andrew's United Church on Coburg Road. :141 A modern 5-storey addition was constructed in 1968. The artist Garry Kennedy was appointed president in 1967 at the age of 31, becoming the youngest ever president of a Canadian university. He immediately moved to remake the college from a provincial art school into an international centre for artistic activity. He invited notable artists to come to NSCAD as visiting artists, particularly those involved in conceptual art. Artists who made significant contributions during this period include Vito Acconci, Sol LeWitt, Dan Graham, Eric Fischl, Lawrence Weiner, Joseph Beuys and Claes Oldenburg. The school was renamed the Nova Scotia College of Art and Design in 1969, the same year it began granting undergraduate degrees. :147 Kennedy is credited with transforming the school into an internationally recognised centre for cutting-edge art, with Art in America suggesting in 1973 that NSCAD was "the best art school in North America". The school began to offer graduate programs in 1973.:161 It moved to its current location on Granville Mall in 1978 and the former Coburg Road campus was acquired by Dalhousie University. :160–161 Garry Kennedy retired from the school's presidency in 1990 to focus on teaching and making art. In 2002 the school purchased the Granville Street block of heritage buildings it had leased since 1978, known today as the Fountain Campus. The institution was renamed NSCAD University in 2003. It opened a second campus, the Academy Building, in 2004. This campus houses the film studies faculty. In 2007 the third campus, the Port Campus, opened at the Halifax Seaport. All three campuses are located in downtown Halifax. The construction of the Port Campus brought the school's debt to a high of $19 million in 2011 after funding from the federal government fell through. The province asked the school to draw up a plan to reduce the debt, and it was speculated that NSCAD might lose its autonomy. NSCAD students, faculty and alumni mounted a "Save NSCAD" campaign in opposition to a merger with a larger institution. The school commissioned a report to study the idea, but the consultant found that a merger would not result in cost savings. The NSCAD board of governors therefore voted on 15 July 2014 to continue as an independent university. The university's financial position subsequently improved, and the debt had been reduced to $13 million by 2015. NSCAD offers bachelor's degrees in Fine Art (BFA), Design (BDes), and Art History (BA). It also offers Master of Fine Arts and Master of Design degrees at the graduate level. The NSCAD University Library was founded early in the school's history and is now located in the Fountain Campus. It is the only art and design library in Atlantic Canada. Its collection includes over 50,000 books and periodicals as well as the Visual Resources Collection, which comprises 140,000 slides, 16mm films, video tapes and other multimedia materials. The library is a member of Novanet, which facilitates inter-library loans between Nova Scotian academic libraries. Historical fine arts and ceramics; contemporary fine arts and printmaking collections are housed in the Anna Leonowens Gallery, founded in 1968. The gallery hosts exhibitions of the work of undergraduate and graduate students, faculty members, visiting artists and curators. The Port Campus hosts the Port Loggia Gallery. The university was also formerly home to the Seeds Gallery, a non-profit gallery where students and alumni could show and sell their work. This made NSCAD the only art school in Canada to offer a dedicated commercial gallery, helping students tradition from academia to entrepreneurship. It was founded by SUNSCAD, the students' union, who turned over control of the gallery to the university in 2007. In 2011 the university moved the gallery from Hollis Street to a more peripheral location at the Seaport, where it had to pay rent for the first time. The new space was a 1,000 square feet (93 m2) gallery in the Annex Building, directly across the street from the Port Campus. In September 2013 the university board of governors decided to close the Seeds Gallery on 31 March 2014. The university governance stated that closure was a cost-saving measure in light of the gallery's $40,000 yearly deficit. The students' union criticized the absence of consultation surrounding the decision and blamed the gallery's financial woes on the decision to relocate it to the Seaport. It stated that the gallery had been on the path to financial sustainability while at Hollis Street. In January 2016 the Anna Leonowens Gallery founded the Art Bar + Projects, a space for performance art. NSCAD has a long and distinguished history of offering the public the opportunity to study in a visual arts environment. The School of Extended Studies continues this tradition by offering the public a wide variety of non-credit studio and audit lecture courses in fine arts, media arts, craft and design. The School also manages the 30-credit Visual Arts Certificate for Teachers program, the 30-credit Visual Arts Certificate in Studio and the pre-university summer study credit program. Credit programs have admission requirements. Noncredit programs have no admission requirements although prerequisites must be met for some courses. Adult Programs The adult studio-based and audit lecture courses are available to individuals who are 16 years or older. These courses are designed to meet personal and professional development interests and to prepare for studies in an undergraduate visual arts degree program. Curricula incorporate skills, processes, and health and safety issues. New approaches and ways of seeing, analyzing, experimenting and problem solving through observation are promoted. To ensure program quality, planning is ongoing with other areas of NSCAD University. New courses are added regularly to introduce different subject matter and in response to public demand. Children and Teen Programs Saturday Children’s Art Classes began in 1887 and are one of the earliest known examples of such programs in North America. Children in grades 1 – 6 participate in a variety of fun age-appropriate activities that introduce basic visual arts skills. Teen Art Studio courses for students in Grades 7 -12 introduce fundamental visual art skills and processes, introduce NSCAD facilities and provide older teens an opportunity to build a portfolio for admission to an undergraduate visual arts degree program. Saturday teen courses are offered during the fall and winter and week-long courses are offered during summer. One-day March Break workshops are offered during the Provincial school break. Night Shift Exhibit An annual Night Shift Exhibition to display student work completed in Extended Studies course is held in the Anna Leonowens Gallery located on the NSCAD Granville campus. Family and friends are encouraged to attend this popular exhibit and enjoy a variety of different works of art created by all ages. Under the direction of Kennedy, The Press of the Nova Scotia College of Art and Design was established as a vehicle to publish books by and about leading contemporary artists. The Press was important in establishing the university's international reputation. Between 1972 and 1987, 26 titles by such artists as Michael Snow, Steve Reich, Gerhard Richter and Yvonne Rainer were published. Re-launched in 2002, The Press has once again become a source for the publishing of primary documents and scholarly works in the fields of contemporary art, craft and design. ^ a b c "Full-time plus Part-time Enrollment" (PDF). Association of Atlantic Universities. 1 October 2016. ^ a b c d e f g h i j Soucy, Donald; Pearse, Harold (1993). The First Hundred Years: A History of the Nova Scotia College of Art and Design. Fredericton: University of New Brunswick. ISBN 0-920114-27-X. ^ "Nutt, Elizabeth Styring". Canadian Women Artists History Initiative. Retrieved 15 November 2017. ^ a b Laskey, Heather (4 December 1985). "Confrontations continue at N.S. art college". The Globe and Mail. p. C7. ^ "School for the avant-garde". Maclean's. 23 October 1993. p. 52. ^ Levine, L. (July–August 1973). "The best art school in North America?". Art in America. 61 (4): 15. ^ Dault, Gary Michael (17 January 1998). "Conceptualism with a human face". The Globe and Mail. p. C14. ^ "The 21st Century". NSCAD Past and Present. NSCAD University. Retrieved 26 January 2017. ^ Willick, Frances (18 July 2014). "NSCAD dreams of all-new campus". Halifax Chronicle-Herald. ^ a b "Nova Scotia College of Art and Design University". The Canadian Encyclopedia. Retrieved 25 January 2017. ^ Willick, Frances (16 July 2014). "NSCAD University to stay independent". Halifax Chronicle-Herald. ^ "Library". NSCAD University. Retrieved 26 January 2017. ^ a b "About". Anna Leonowens Gallery. Retrieved 26 January 2017. ^ "Anna Leonowens Gallery, NSCAD University". Virtual Museum of Canada. Government of Canada. ^ "Anna Leonowens Gallery". NSCAD University. Archived from the original on 2013-05-15. Retrieved 2013-05-30. ^ a b "Seeds Gallery moves to Halifax Seaport". NSCAD University. 10 March 2011. ^ a b "Seeds Gallery closure at NSCAD upsets students". CBC News. 24 October 2013. ^ a b c Beaumont, Hilary (23 October 2013). "NSCAD closes student gallery, shop". Halifax Chronicle-Herald. ^ "Biography". Senate of Canada. Retrieved 26 June 2017. Wikimedia Commons has media related to Nova Scotia College of Art and Design University.